Filmmaker, Writer, Actor, Poet, & Attorney. Background and Legal Career: Oliver Oscar Mbamara started writing and acting while pursuing a legal career in Nigeria before moving to the United States where he became a State Admin Judge, a position in which he has served for over fourteen years. Mr. Mbamara has been a long standing member of the Nigerian Lawyers Association (USA) and has served in various capacities for the association up to the level of the chairman of the board of directors. Writing & Artistic Career: Oliver continued his writing and artistic career in the USA and has published a number of books on Poetry and Africa-themed essays. In 2001, he broke into American theater and entertainment circles with his lead role in the off-Broadway show – PRISONER OF KALAKIRI. He then returned to the big screen where he became one of the pioneering Nollywood filmmakers in the USA when he teamed with colleagues to make the ground breaking Nollywood film titled THIS AMERICA (2004) based on his novel that chronicled the conflicts and experiences of an African immigrant in America. He has since produced, directed, and acted lead roles in several feature films such as SLAVE WARRIOR , ON THE RUN AGAIN, and the SPADE MOVIES SERIES. One of his latest works is the creation of the pioneer African Diaspora TV series titled CULTURES. Oliver recently graduated from the New York Film Academy where he studied Filmmaking. 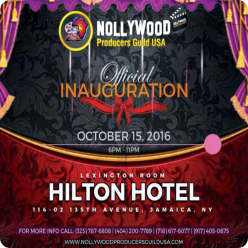 He is the current president of the Nollywood Producers Guild, USA. 2014 Nigeria Centenary Achievement Award (NCAA) USA. 2012 NAFCA Best Cinematography Award.